MELBOURNE’S African gang crisis has escalated after a violent three-hour crime spree saw victims beaten, dragged along the road and forced to fight attackers out of their homes. Capping a week of controversy over the ­political response to the wave of street-gang terror, a 59-year-old woman was traumatised by 14 ­African men who stormed a house she was looking after for relatives, in Hillside in the city’s northwest. Four held her hostage in the front room and hit her in the face, while the other 10 ransacked the property on Thursday night, stealing car keys and electrical items. Homeowner Sam — too scared to give her surname — said her relative was now struggling to cope. “She opened up the blinds in my house to see them running towards her,” she said. Commander Russell Barrett of Victoria Police vowed to catch the ­offenders and lock them up. “This behaviour is abhorrent, it is just thuggish behaviour by a group of young people who have no apparent care for the rights and wellbeing of their fellow citizens,” he said. In the other attacks in Melbourne’s west on Thursday night, a teenage boy was hit with a baseball bat and dragged along the street in Taylors Hill; another teen was punched and kicked to the ground in a separate attack in Cairnlea hours later; and a brave 60-year-old dad was forced to use a baseball bat to defend his family against home invaders in Delahey as his terrified wife hid in a bedroom and a son dialled 000. 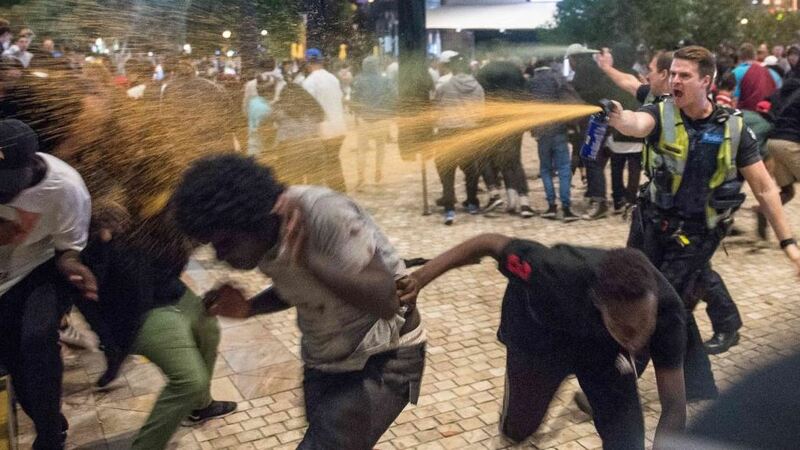 Hours after the frightening crime rampage, an African teen who kicked a policeman at Highpoint Shopping Centre was finally refused bail on Friday over that Boxing Day attack. He had been freed from custody for just two days when he was caught in breach of a condition of bail — using a mobile phone. In the Delahey incident, the father of three said he grabbed the bat and shoved three African males away from a window they had smashed near the front door. Two of them then ran to the side of the house and rammed the garage door down before forcing their way into the family home. The brave dad continued to fight off the group as his wife locked herself in a bedroom. A short time later, the couple’s youngest son arrived home from work, scaring the violent thieves into fleeing with only a mobile phone. The 18-year-old got into a family car to follow the invaders’ white sedan for about 10 minutes but lost track of them after they ran several red lights. “It’s put a lot of fear into me and my family,” he said on Friday. Fearful residents in some western suburbs have now revived street patrols — used when the Apex gang terror emerged in 2016 — to protect neighbourhoods. Michelle Denaro says that in her area patrols by locals are being ramped up. “As a community we will band together and do what is necessary to move these people on again,” she said. The African youth gang crisis has escalated over the last month — including the trashing of the Ecoville Community Centre in Tarneit — to the point where politicians and police now admit a serious problem. South Sudanese community leaders warn more than 500 youths have been absorbed into violent gangs across Melbourne.